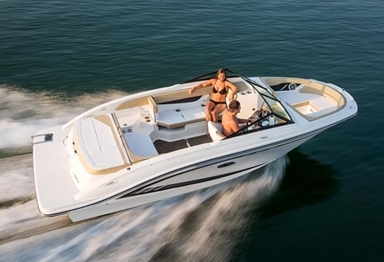 New 2019 Sea Ray SPX 210 powered by Mercruiser 4.5L MPI and equipped with the best options. Includes Elevation Package with tower, stainless steel upgrades, cockpit and tonneau covers, Infinity woven vinyl flooring, swim platform with SeaDek, depth finder, battery on/off switch, bucket seats, Karavan trailer and more. All trades considered.